SERBIE – Bare - A prehistoric settlement from the early and late Iron Age and several remains from the Ancient Period (from 1,000 BC to II-III century AD) have been discovered at the site of Bare, southern Serbia. Several objects dating from the Iron Age were found on a terrain covering about three hectares of space, said the head of the team, Maja Djordjevic of the Institute for the Protection of Cultural Monuments of Serbia. The discoveries from the Ancient Period include the foundations of a Roman villa that used to be part of a farm and parts of pottery objects. The found remains, said Djordjevic, point to a rich life at the locality, where there used to be a large settlement at the time. Due to torrential waters and intensive agriculture at the location, the multilayer site Bare is now largely destroyed. "Had the site been investigated in the sixties of the last century, the archaeologist's findings would have been far richer, unveiling more significant remnants of the past," Djordjevic said. ROYAUME UNI – Bridgnorth - Work has started to fill a hole that opened up in a Shropshire street. The hole, almost six feet deep (1.8m), at Bank Steps in Bridgnorth was caused by a roof collapse in a previously unknown underground vault. John Williams, from Shropshire Council, said the vault might have been part of a larger cellar and cave network that runs under the town. He said concrete would be added in stages and work was expected to be completed by the end of the week. He added it was unclear what the vault had been used for, but it might also have been designed to support the steps, which overhang a sandstone cliff. Dozens of vaults and man-made caves run under the town. Some were inhabited, while historians believe others were used for access or storage. Bridgnorth's low town, which developed around the River Severn, was once a thriving commercial port. In 1989, extensive research was carried out on the caves by members of the archaeology unit at Birmingham University. 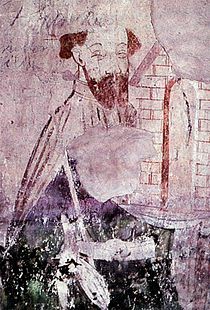 SUEDE – Stockholm - The Swedish King Magnus Ladulås (1240-1290 a.d.) is buried in the Riddarholmen church (Riddarholmskyrkan) in Gamla Stan, Stockholm. This is at least what everybody have taken for granted...until new facts were presented recently. A new radiocarbon dating of the tomb's content indicates that the content of the tomb comes from the remains of nine persons who were buried some time between 1430 and 1520, i.e. at least 200 years after King Magnus. It is thus clear now that King Johan II (son of Gustav Vasa) put up the pompous tomb above the wrong grave. The research group around Magnus Ladulås tomb is very excited about their new discovery and want to open a nearby tomb. They write the following on their blog: "It is a fantastic story that is rolled up in front of our eyes. Johan II had the impressive tomb put up above the wrong grave and this historical hoax has been unchallenged for 400 years! On good grounds we believe instead that Magnus Ladulås was placed in the southern tomb in front of the choir, i.e. the tomb in which King Karl Knutsson placed himself in the 15th century. With the knowledge we have today it is obvious that we have only done half the job. In order to make further progress in this project we need to open also the southern part of the choir-tombs (the tomb of Karl Knutsson) and investigate all individuals there." (Stockholm News translation.) If the research group's application to open this tomb is accepted by the Royal court of Sweden, it can start in 2014 at the earliest. King Magnus Ladulås was the first 'Magnus' to rule Sweden for any length of time. He was king of Sweden 1275-1290. The name 'Ladulås' is thought to come from his decree of 1279 prohibiting travelling nobles or bishops to demand from the peasant to provide them with food and beds. The word Ladulås is therefore believed to be the name he got after this decree. Ladulås means "the lock of the barn", i.e. the right of the peasants in Sweden to say no to travelling nobles of enterring their house. Another theory of the name 'Ladulås' is that it refers to his Slavic heritage and would in that case be 'Ladislaus'. ROYAUME UNI – Steventon - Archaeologists in Hampshire have uncovered signs of the house where Jane Austen spent more than half of her life. The Austen family lived in the rectory in Steventon, near Basingstoke, from 1775 to 1801, where the writer began three of her novels. The house was demolished early in the 19th Century soon after Austen and her family moved to Bath. ITALIE – Rome - Le tombeau de l'illustre famille des Scipion, dont Scipion l'Africain, vainqueur d'Hannibal, fut le membre plus éminent, rouvrira le 27 décembre au public près des Thermes de Caracalla à Rome, après une vingtaine d'années de fermeture et d'importants travaux de restauration. Le site est composé d'une série de galeries souterraines, hautes de deux mètres, qui se croisent pour former un carré d'environ 11 mètres de côté creusé à même la colline de tuf. Dans la paroi des galeries étaient creusées des niches destinées à contenir les sarcophages. La construction du monument funéraire, couronné à l'origine d'un édifice à colonnes aujourd'hui disparu, fut décidée au début du IIIe siècle avant JC par le consul Lucius Cornelius Scipion Barbato, dont l'élégant sarcophage trône au fond de la galerie centrale. Les Scipion, une branche de la "gens" (clan familial) Cornelia, occupèrent de hautes fonctions politiques et militaires à l'ère romaine. Ce fut le cas notamment de Scipion l'Africain (235-183 av JC), vainqueur d'Hannibal pendant la seconde guerre punique, contre Carthage. Fait surprenant, Scipion l'Africain n'y est pas enterré : accusé de s'être approprié des deniers publics, il quitta Rome pour Linterne (dans l'actuelle région de Naples). L'épitaphe sur son tombeau, situé en territoire non romain, disait : "Ingrate patrie, tu n'auras pas mes os". Le tombeau avait été découvert par hasard en 1780 par deux frères prêtres, propriétaires d'une vigne au-dessus des vestiges et qui le mirent au jour au cours de travaux pour agrandir leur cave. 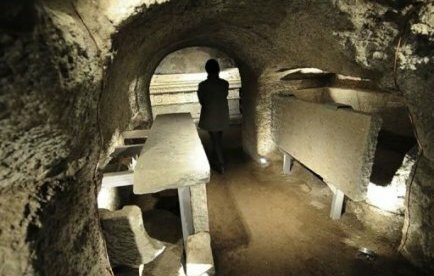 Outre le tombeau des Scipion, le site comporte un columbarium souterrain installé plus tardivement et contenant quelque 180 niches sur cinq niveaux avec des décorations peintes, ainsi qu'une petite catacombe longue de 12 mètres. La zone archéologique, qui avait fermé ses portes en 1992 en raison de son mauvais état, s'étend sur plus de 2.000 m2 le long de la section urbaine de l'Appia Antica, à cinq minutes à pied des Thermes de Caracalla.